The BMA presents more than 130 rarely shown artists’ books and related prints by more than 50 renowned artists, including Pablo Picasso, Joan Miró, Grace Hartigan, David Hockney, and Ed Ruscha. Stephen King, Frank O’Hara, and Robert Creeley are among the more than 30 authors represented. An artist’s book—an artwork conceived of and produced in book form—often reflects the collaborative work of visual artists, writers, printers, and publishers and can vary as widely as artworks in other media. The BMA’s rarely shown collection of artists’ books is presented in 12 thematic groupings of works, such as animals, typography, Pablo Picasso, and Wassily Kandinsky. Among the exhibition highlights are Thirty-Six Views of the Eiffel Tower (1902), Henri Rivière’s Japanese woodcut-inspired images of the French landmark; Bestiary, or The Parade of Orpheus (1911), a book of elaborate animal woodcuts by Raoul Dufy with poems by Guillaume Apollinaire; and Ready for Anything (1958), Joan Miró’s whimsical color woodcuts with text by Paul Éluard. Two other remarkable books are 1¢ Life (1964), 61 vibrant color lithographs by Jim Dine, Roy Lichtenstein, Andy Warhol, and others that accompany poems by Walasse Ting, and The Departure of the Argonaut (1986), a gigantic bound volume with 48 color lithographs by Francesco Clemente and letterpress text by Albert Savinio. More than half of the works have never been exhibited before at the BMA. The exhibition is the capstone of a collaborative project between the BMA and The Johns Hopkins University (JHU) led by Rena M. Hoisington, Senior Curator of Prints, Drawings & Photographs. Hoisington taught the course “Paper Museums: Exhibiting Artists’ Books at The Baltimore Museum of Art” through JHU’s Program in Museums and Society for 11 undergraduates from JHU, Loyola University Maryland, and the Maryland Institute College of Art. The students helped to determine the checklist and thematic organization of the exhibition as well as write the label texts and blog posts for the books. For more information about exhibitions, programs, courses, and resources on artists’ books in the Greater Baltimore region, please visit Book Arts Baltimore. Off the Shelf: Modern & Contemporary Artists’ Books was organized in collaboration with The Johns Hopkins University’s Program in Museums and Society, and supported by The Johns Hopkins University through a grant from The Andrew W. Mellon Foundation. Additional support has been provided by the National Endowment for the Arts and the Trust U/W of Helen M. Hughes. 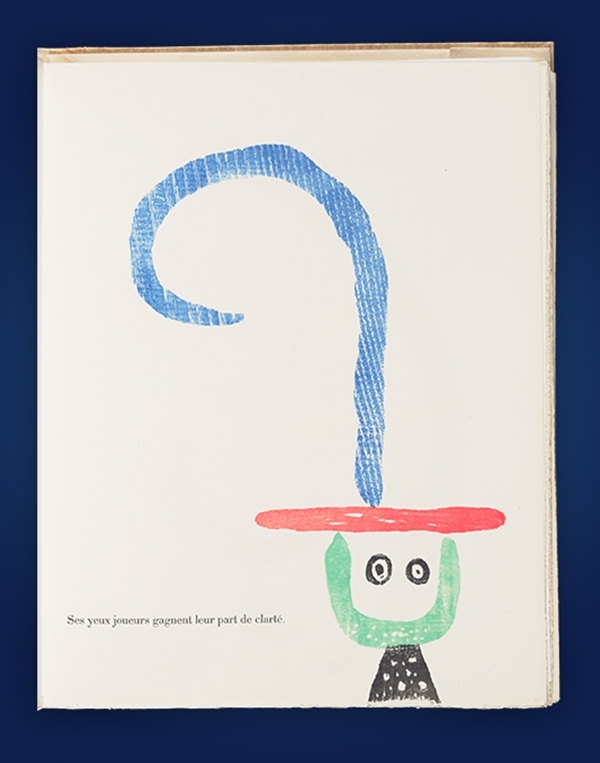 The BMA presents more than 130 rarely shown artists’ books and related prints by more than 50 renowned artists, including Pablo Picasso, Joan Miró, Grace Hartigan, David Hockney, and Ed Ruscha.